At one time, I experimented quite a bit with painting on the original iPad. When it would no longer support new updates, I replaced it with the iPad Mini with Retina Display, which is a horrible name, so it’s now just referred to as the iPad Mini 2. 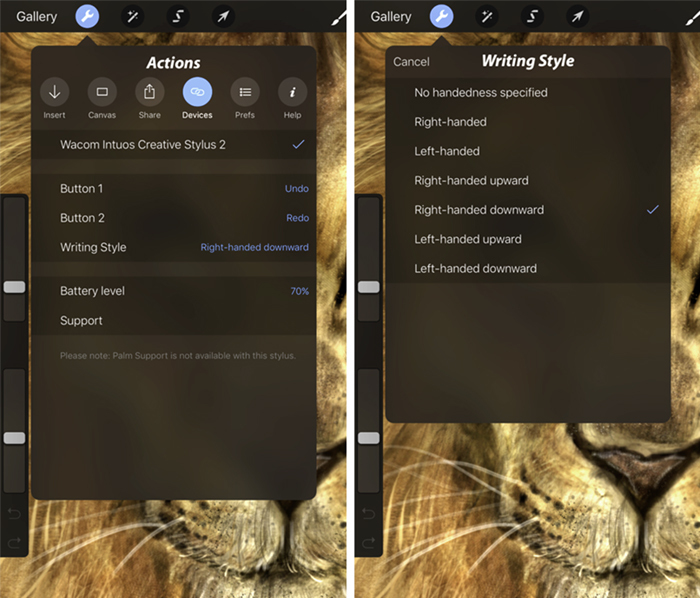 Having tried a number of apps over the years and more than a few styli, I finally settled on the combo I liked best, which was the procreate app and the Wacom Intuos Creative Stylus 2, another unwieldy moniker. So, let’s just call it the ICS2. While you’d be hard pressed to hear me say anything negative about Wacom’s Intuos tablets or Cintiq displays, the ICS2 has had some issues. Complaints of poor tracking and cursor alignment aren’t hard to find. It works well with some apps, not with others. I’ll simply say that there are plenty of people unhappy with the stylus, especially if they have the full-sized iPad 2. I haven’t done much iPad painting lately because I’ve been busy working. In my home office, I have Wacom’s Cintiq 24HD display and when I want to draw elsewhere in the house, I have the more portable 13HD display. With these two professional options and my constant deadlines, drawing on the iPad hasn’t been a priority. Recently, however, I stopped by the Apple store in Calgary and took the new iPad Pro and Apple Pencil for a test drive. A little later, I found myself in the Microsoft store comparing it to the Surface Pro 4. 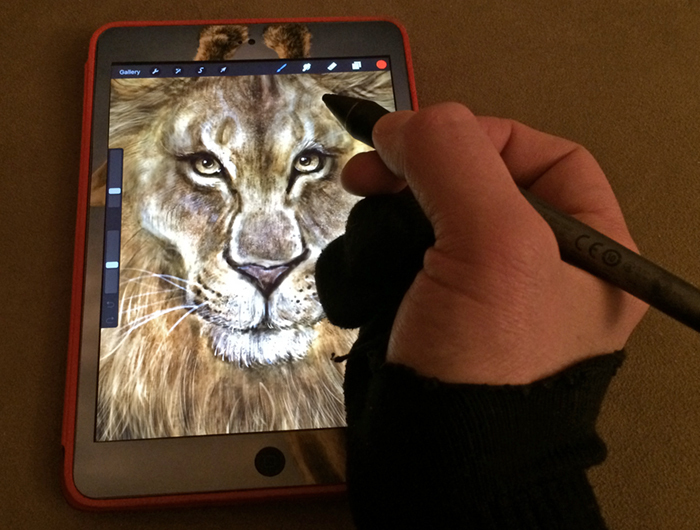 I quite liked the iPad Pro and Pencil, easily the best stylus I’ve ever used on a device. It felt fine in my hand, had a contact feel I liked, was flawless in its accuracy and I wanted to use it more. While I didn’t get to try it with procreate on the store model, the sketch program they had on the tablet was good enough. 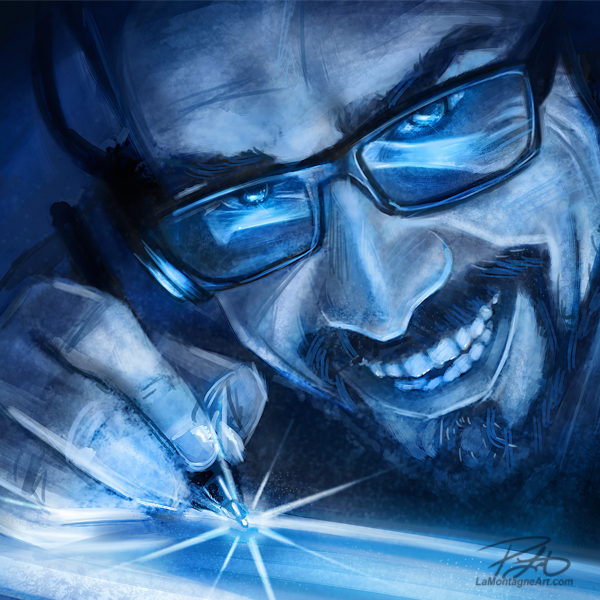 I didn’t really like the Surface Pro drawing experience, but many people do. My desktop computer is robust, I’ve got a powerful laptop, the Wacom displays I mentioned and an iPad Mini 2. I currently can’t justify buying an iPad Pro. It’s quite expensive and so is the pencil. It’s a want, not a need. 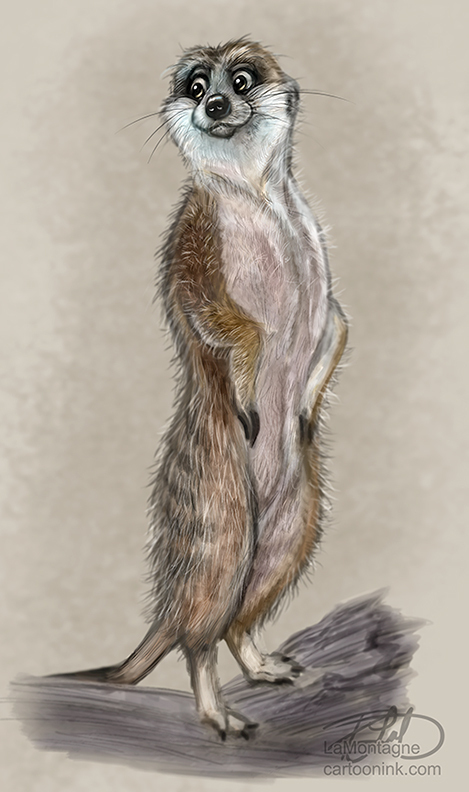 Playing around with it, though, got me itching to try some more iPad painting with the device and stylus I do have. This lion is the result. At first, having not used procreate in quite some time; I was still having some issues with accuracy. I had to paint while holding the iPad in portrait mode. Whenever I tried to paint in landscape mode, the registration would be off. 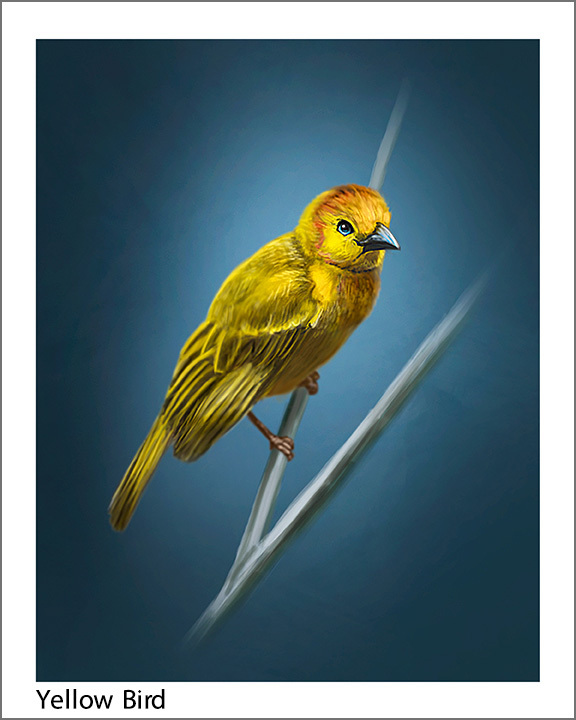 The same thing happens with Autodesk’s Sketchbook Mobile, another impressive app. From what I’ve read, it seems to be a flaw in the ICS2 software or hardware, not playing nice with third party apps. It’s frustrating. Not one to easily give up, I started going through the settings again and found the Writing Style options. By trying different ones, I found the right setting for me and the accuracy came back! 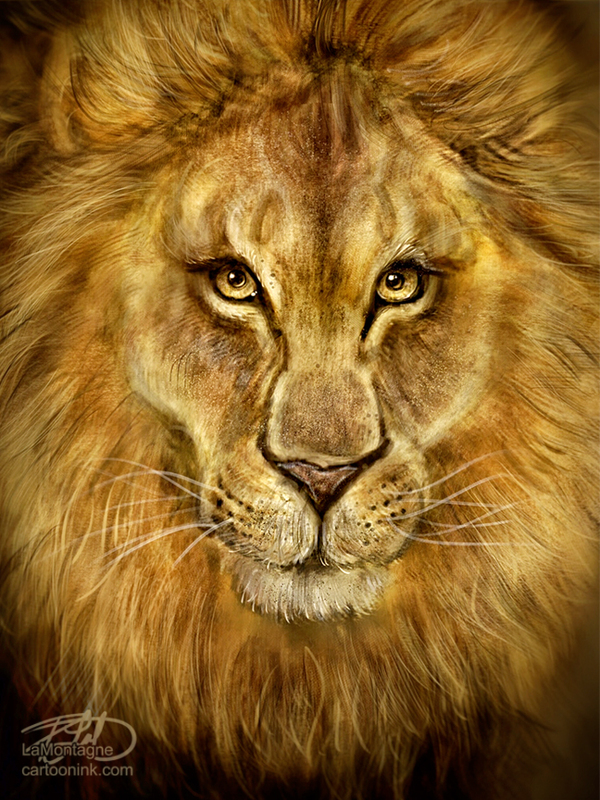 Painting this lion suddenly became a lot more fun when I didn’t have to fight the technology. The procreate app not only comes with an excellent selection of brushes for many different art styles, but their brush engine is quite good. I’ve always been one to design my own brushes, especially for hair, and procreate allows me to do that. It involves just as much trial and error experimentation as Photoshop brush design does, but by continually tweaking, I managed some pretty impressive results. Palm rejection does not seem to be flawless on any device with any stylus. I rest my hand on the screen when I draw and paint. Had I gone to art school or been professionally trained, they would have broken me of that, no doubt. The problem is that the device registers the palm/heel touch as an intentional brush stroke on many devices/apps so you end up with digital smudges and poor pen strokes from the stylus because the app is trying to interpret two points of contact. My workaround is that I bought a pair of glove inserts, cut the index, middle, and thumb from it. This allows me to still use the touch features, but rest my hand on the screen without a problem. Fair warning, a very thin costume glove won’t work. The iPad will still sense the contact of your palm or heel of your hand. Here’s a photo. Disregard the blown-out screen image as that’s not how it actually looks when I’m painting. The second thing is that whenever I paint on the iPad, I have the display brightness set in the middle of the slider or lower. My Cintiq displays are set quite low as well, both the display brightness and backlight. It’s just easier on my eyes, especially since I can spend many hours in a day in front of a screen. As a consequence, I usually have to do some colour and light adjustments to anything I paint on the iPad, or it will look far too dark when it’s done. For this, I use Snapseed and the relatively new Photoshop Fix, which are both quality image editing apps. Even still, when this was as close to done as I could get it; I opened it in Photoshop on my desktop and did a couple more small lighting adjustments. All of the painting, however, was done on the iPad. It’s unlikely I’m going to be doing a lot more iPad painting with the tools I’ve got. 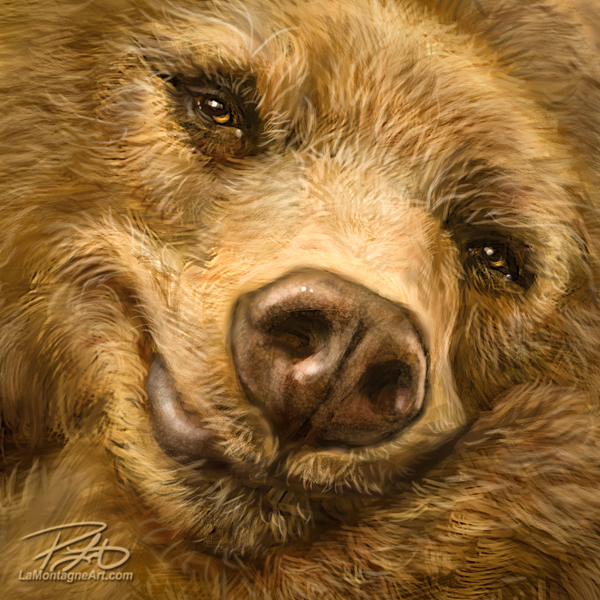 It took longer to paint this than it would have on my professional displays and the result is not as nice or detailed as that which would have been achieved had I painted it all on my desktop or laptop. Would that change if I bought an iPad Pro and Apple Pencil? I don’t know, but honestly, I kind of doubt it, even with the larger surface area to work with. I would still like to spend more time with it, though. In all things, however, it pays to experiment, especially with art. You never know until you try and this was worth doing, just for the experience. Anybody who has ever run their own business knows that it’s all one experiment after another. In this day and age, our attention spans are shorter than ever so if you’re in the business of sales, you need to be looking for new ideas of promotion and catching people’s attention. While it’s true that I produce new editorial cartoons almost every day, many of the people who follow me on social media and my site are interested in my painted work, so it’s important that I keep them coming back. It’s not enough to tell somebody where to find me; I’ve got to make sure I make it worth their time to do so. My Totem and commission paintings take a great deal of my time to complete, mostly because I have other work to do at the same time, like those editorial cartoons I mentioned. There can be weeks and sometimes (much to my horror) months in between finished full detail paintings. That’s a lifetime in the online world. While I’ll often post work-in-progress images during the process, I can’t always do that, especially if I’m working on a commission. 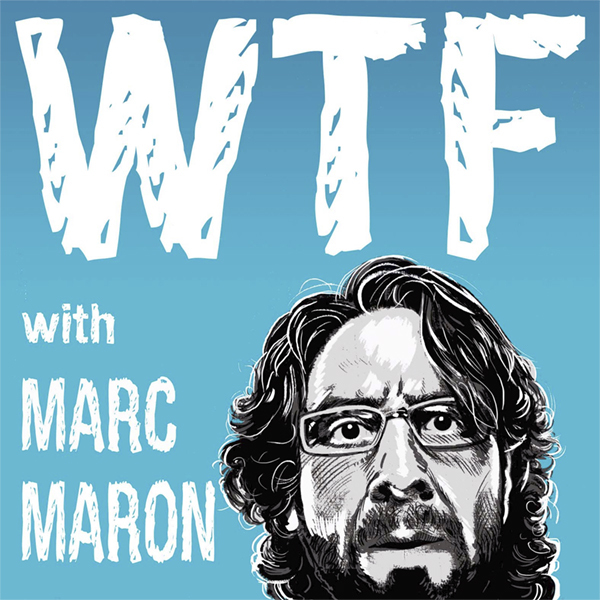 Ruining your client’s surprise gift is bad for business. To improve my painting skills, satisfy my desire to work on new things and to keep that new work flowing, I started doing what I call ‘sketch paintings’ a while ago. Some have taken exception to that title because they’re really not sketches and I’ll concede that. I call them that because in my mind, they’re not finished pieces, meaning that they don’t contain the meticulous obsessive detail of my other work. I’ve recently realized that people don’t care and it does me no good to disagree with them when they say they like a sketch painting as is. That’s always good for business…tell your customers they’re wrong. I’m a slow learner sometimes, but at least I eventually get there. A number of people have asked about prints of the sketch paintings and I’ve declined to offer them because the work isn’t finished. Again, somebody wants to give me money for my work and I’ve been telling them no. This Canadian cartoon guy isn’t too bright. So, in order to correct my error, I decided to order up of a small selection of sketch paintings and offer them up for sale. They’re giclée professional quality prints, same paper and printing as my matted prints, but without the mat, bio, or clear sleeve. 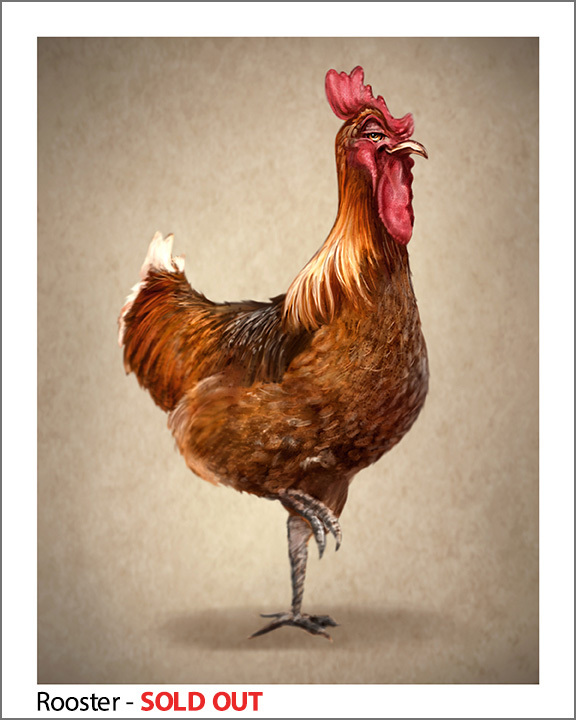 An 8”X10” print, which includes a ½ inch white border and each is hand-signed. They’re $15 each + shipping, which will be minimal because the print fits into a standard business envelope between two pieces of cardboard for protection. This time around, only four of each was available, so it was first come, first served and newsletter subscribers had 24 hours to order before I posted the offer here. 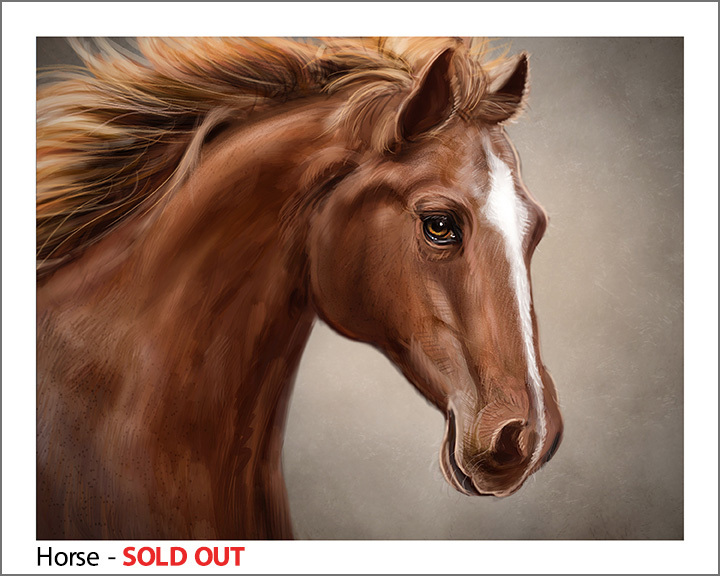 As a result some of the images below are already sold out and there are only one or two of the others available at the time I posted this. As they sell out, I’ll update this post to reflect that. I already consider this a success as some sold out quickly and a few early responders still didn’t get the ones they wanted, so I will do this again. 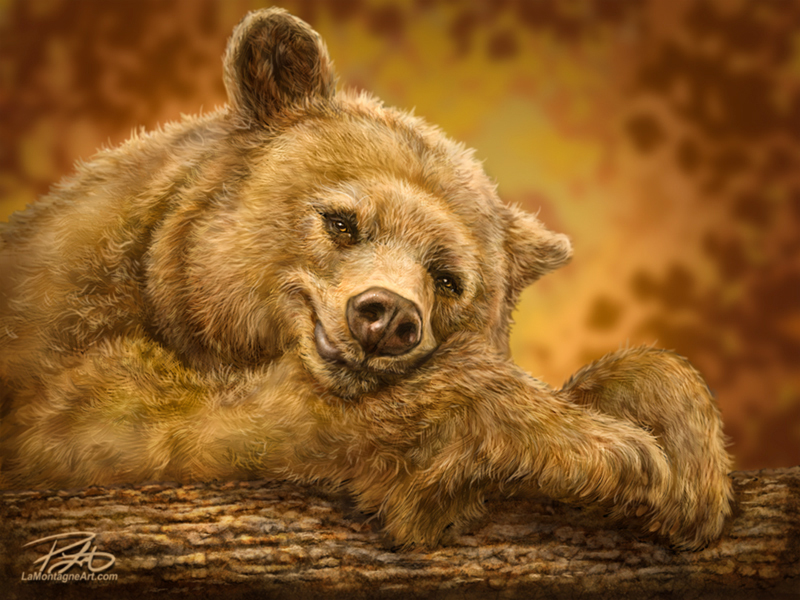 Newsletter subscribers will still get first crack at them, so if you haven’t subscribed and want a shot at any future prints of this nature, I would encourage you to sign up at this link. To order any of the available images below, send me an email to lamontagne@nullcartoonink.com with your mailing address and indicate whether or not you’d like me to send you a Paypal invoice or want to pay by Interac e-transfer. You can order as many as you’d like, while supplies last. 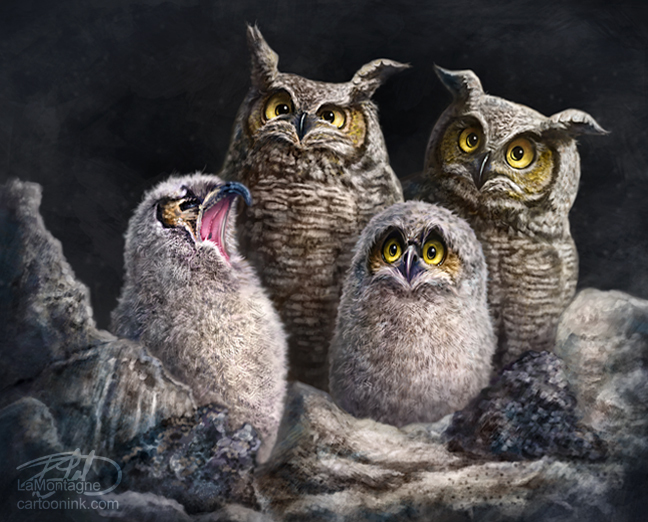 Here’s my latest painting, entitled, “One in Every Family.” In this case, it’s a family of Great Horned Owls that I had the privilege of watching for a few weeks in June. Grassi Lakes here in Canmore is a short hike and easily accessible. It’s usually quite busy on weekends and during the summer, but if you get there early and take the difficult route (not that difficult), you meet relatively few people on the way up. If memory serves, it’s about a 20 minute hike one way, at a brisk pace. The lakes themselves aren’t large, two connected ponds really. The attraction is their emerald colour. Seemingly iridescent blues and greens make for a very nice scene and it’s a popular spot for locals and tourists alike. Some benches, bridges and reinforced paths, and on one side of the far lake, you find a large rock face which is actually a fossilized Devonian coral reef. It’s also a popular climbing wall. Grassi Lakes is great when I don`t have a lot of time, but still want to get some exercise. It’s picturesque, an interesting trail and at the lakes themselves, there is plenty of opportunity to take photos of Golden Mantle Ground Squirrels, a favorite critter of mine. When I said that I hadn’t, she pointed across the lake to the rock wall. About 40 feet up is a little cave and sitting atop one of the rocks was a big Great Horned Owl. I thanked her and moved around the lake for a better look and with my camera at full zoom, I was able to see the owl very clearly. 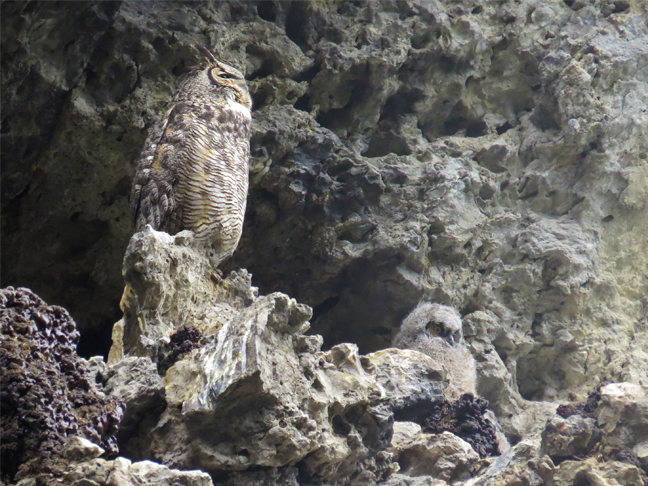 I could also see an owlet that until then had just looked like another rock. The camouflage was perfect. As it’s a provincial park, I wasn’t surprised to see an obvious red sign chained into the wall at ground level below the cave. I never actually went to read it, but somebody told me it was a warning that this particular climbing route was closed for the protection of the owls. Climbers were on the wall, but all were giving the nest a wide berth. 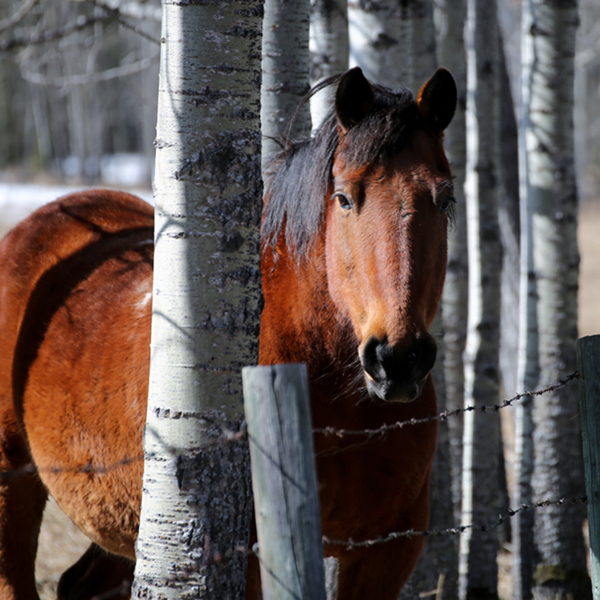 Over the next few weeks, I went back up to Grassi Lakes with a pair of binoculars (that I happily shared with interested tourists) and a tripod for the camera. I took well over a thousand photos, most of them at full zoom, and probably ending up keeping a couple of dozen. Great for reference, not so much for print, but since I hadn’t planned on that; I was very pleased with the results. The owls seemed to have no concern at the people watching from below and it usually took a raven or other bird flying by to capture their interest, although the little ones did seem fascinated by a couple of dogs splashing in the lake on one occasion. 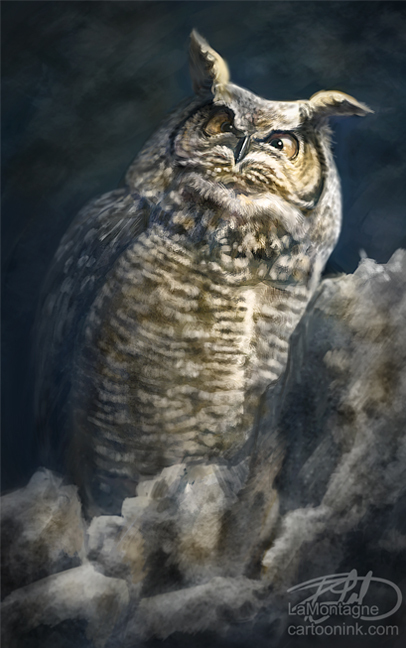 While I’ve painted a Great Horned Owl before, I honestly didn’t know much about them. 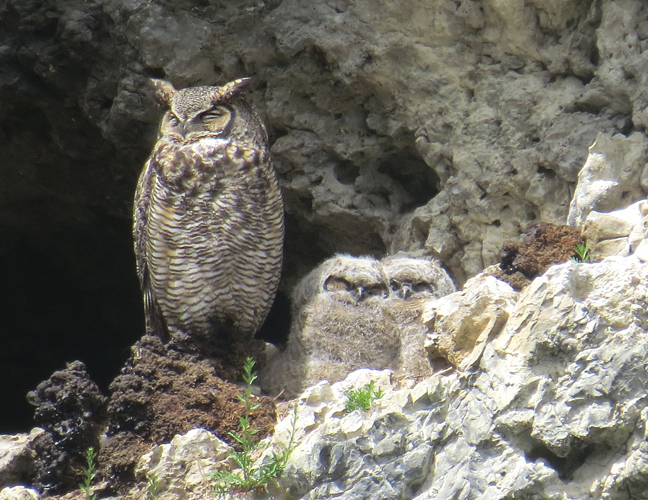 With plenty of information online, I learned a great deal about what I was seeing, including the family dynamic, the breeding season, how long the owlets would stay with the parents…the info is easily found if you Google it. 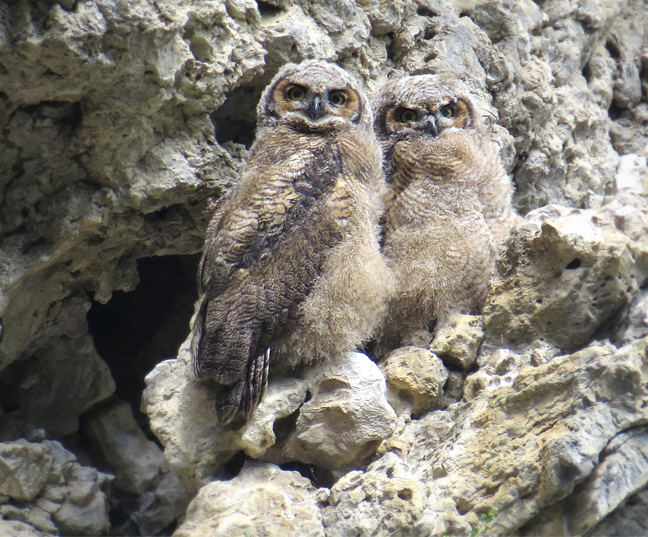 During my visits, I was able to watch their behavior, saw both the male and female parents (the female is larger) and the two owlets. 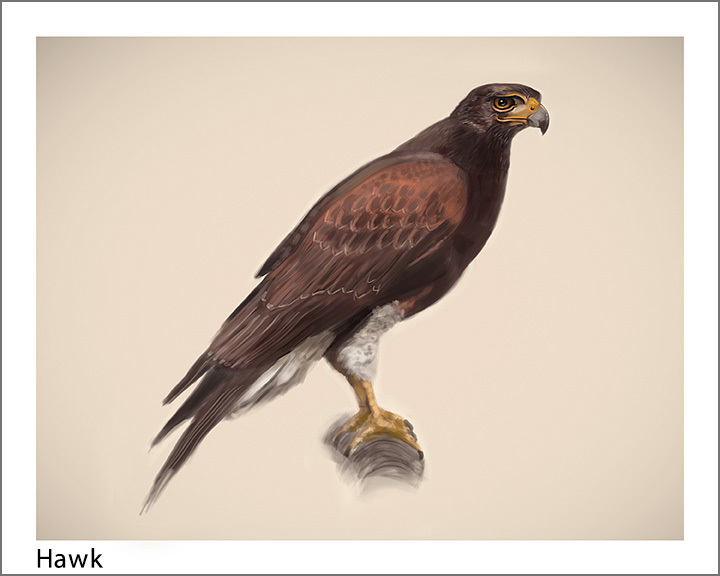 Both of them grew very fast and by my fifth visit, they looked quite a bit larger and their feathers had changed to look more like their parents and less like the fuzzy little balls of fluff that they are in the painting. 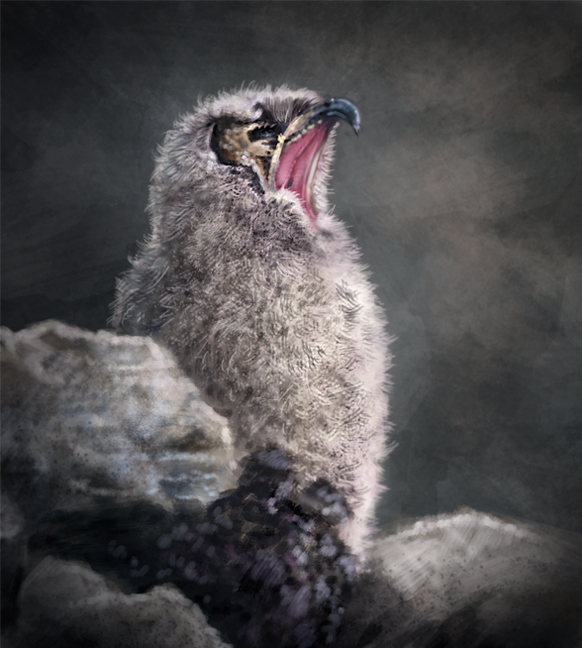 They grew braver and started venturing out further along the rocks away from the cave, were actively hopping and flapping their wings, practicing their calls and mimicking their father, who seemed to spend the most time with them. A real joy to watch. On my sixth visit, I didn’t see them at all. A friend had said she didn’t see them the day before, either. Judging by what I’d read, my assumption is that they had learned to fly and although they do stay near the nest until the fall, my guess is that they’re also exploring their surroundings and learning to hunt. I don’t think I can expect to see the whole family hanging about the nest any longer, so I stopped going to see them. 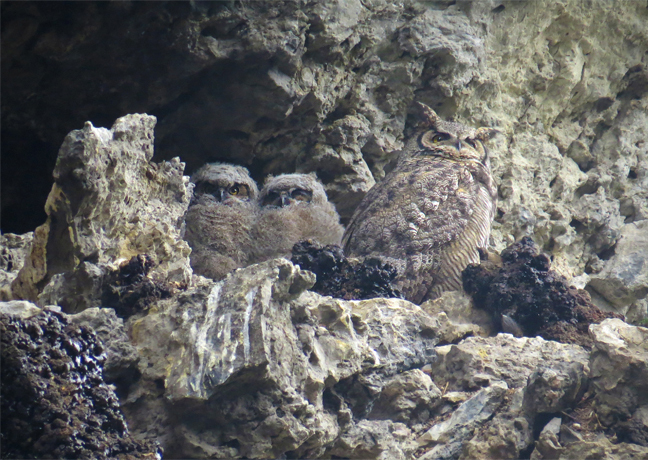 Some locals have mentioned that the mating pair returns to that cave each year, as Great Horned Owls mate for life. The fact that I’ve never seen them before means I probably just wasn’t paying attention to that part of the wall on previous visits and they’re not obvious. I’m looking forward to next spring to see if they return and raise new young. A family of owls in the wild was a treat. Initially, I was just going to do a few sketch paintings and move on. I started out with one of the adult male looking angry at some ravens that were harassing the nest, then another of one of the owlets trying out his lungs. The noise was truly pitiful and I laughed out loud while watching it. 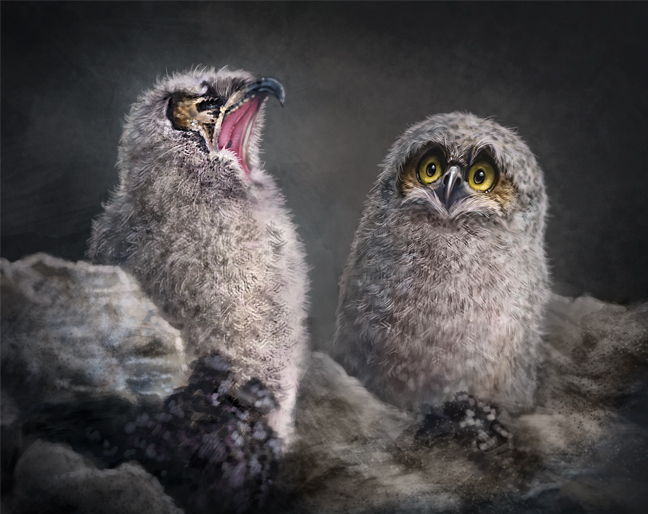 Finally, I added the sibling to the initial owlet sketch painting, looking surprised. After that, I knew I was going to paint the whole family and that it would be a finished piece. 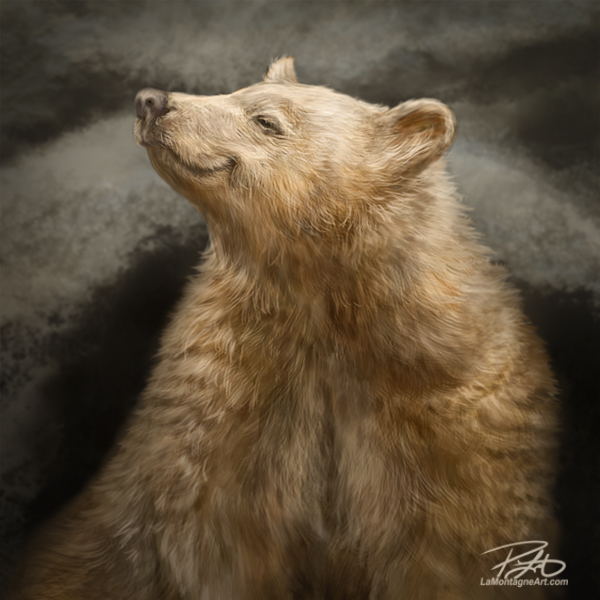 All of the sketch paintings and the final painting were done in Photoshop with a Wacom Cintiq display. I like to think that’s also his expression in the painting. 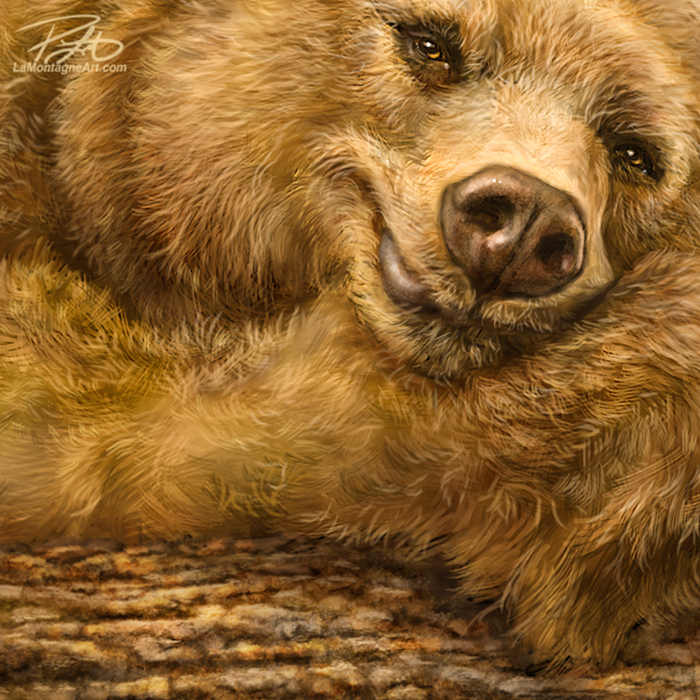 This whole experience was a real thrill and I think I’ll try painting more scenes like this, featuring other animals. I’ve already got one in mind but likely won’t get to it right away. I’ve already got the reference, though, so you never know. 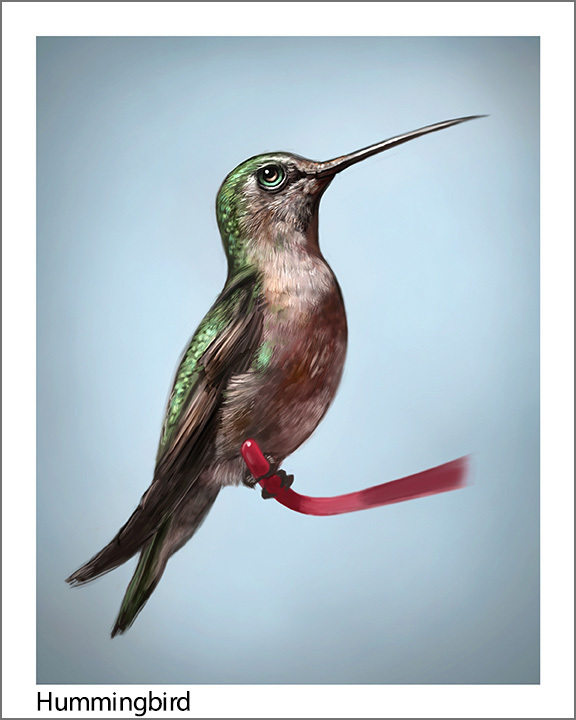 Pre-orders are available for an 11″X14″ matted giclée print of “One in Every Family” until August 30th and they will be shipped in the latter half of September. For more information or to order, follow this link. Exshaw, Banff, and Canmore residents, please order by email for free delivery. One of my favorite stops when I visit The Calgary Zoo is the meerkat enclosure. A colony will always have one meerkat standing guard, which puts him or her at the highest point in the area, keeping a lookout for predators. 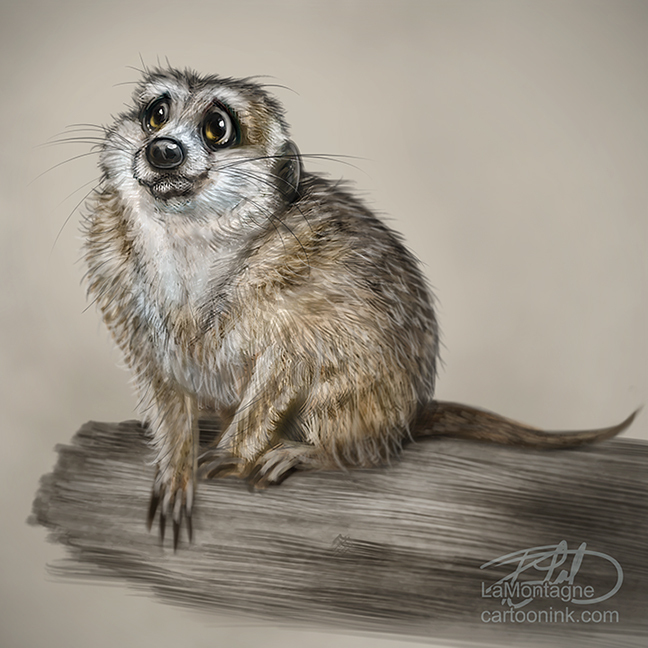 It’s an instinctual trait as it occurs even with meerkats who are born in captivity. They just take turns. 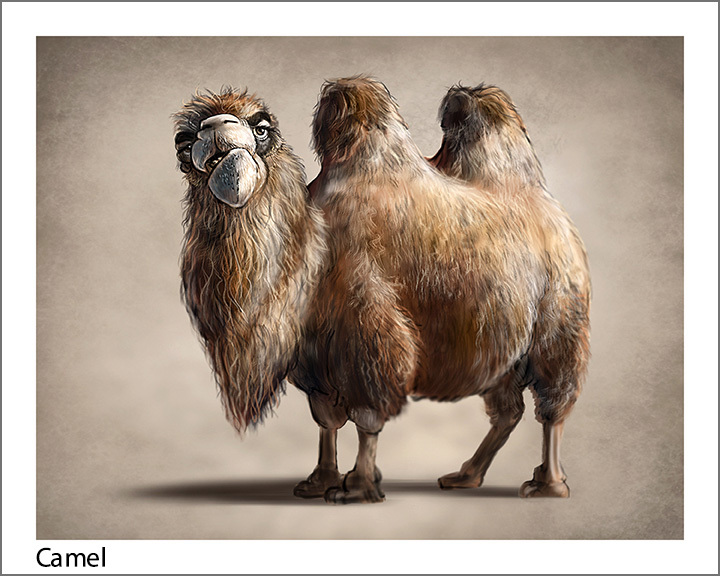 While they have nothing to fear from predators at the zoo, this behaviour is fantastic for taking reference photos. You couldn’t ask for a better subject as one will turn this way and that, remaining as still and posed as a fashion model in a photo shoot. This painting is still pretty rough but it was a lot of fun. 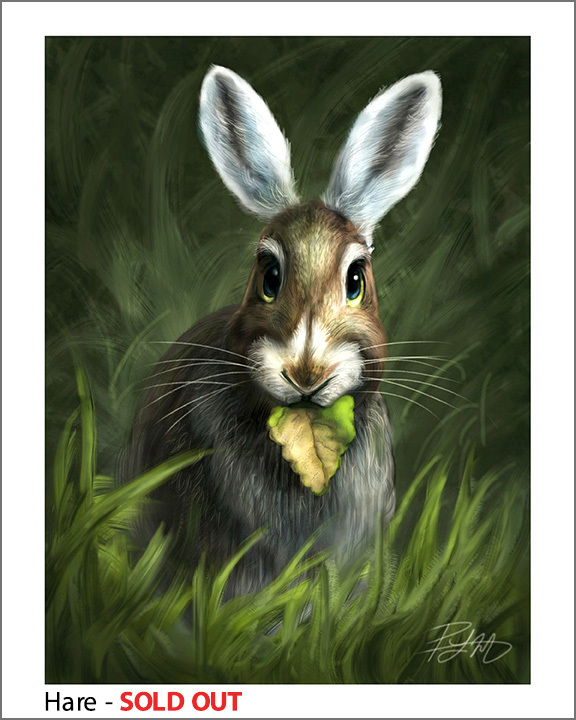 I will probably be painting more of these little critters in the near future. 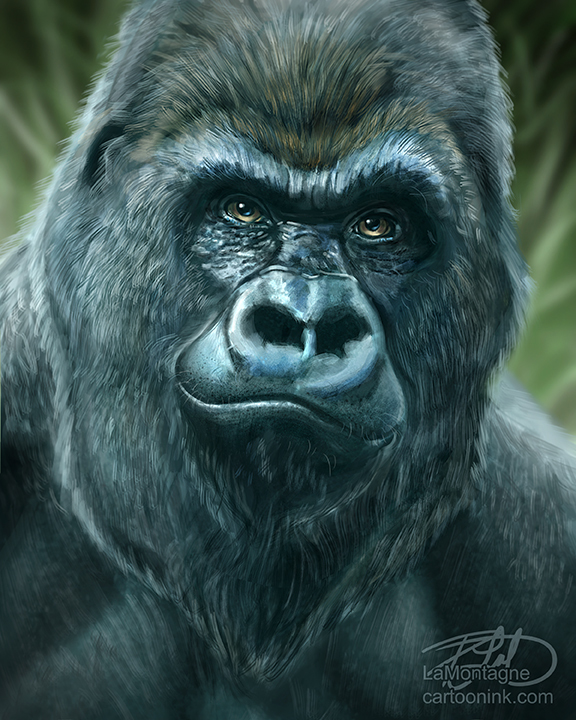 In my continuing efforts to paint more, I decided to do another rough painting sketch of a gorilla this afternoon. I just couldn’t stop, however, so I took it further than I had intended. I was having fun, dammit! While I think I might compose it a little differently, maybe show a little more of the body, this may end up a Totem painting. Woke up earlier than I wanted to this morning on the first day of the year. As I’m usually an ‘early to bed, early to rise’ type, the cat is used to me getting up at 5AM. Creatures of habit and routine, she was pawing at my legs at 5:30, clearly not concerned that I had stayed up late last night. As I’m not one who is able to get up for a half hour and then go back to bed, it was a good excuse to do something creative first thing. 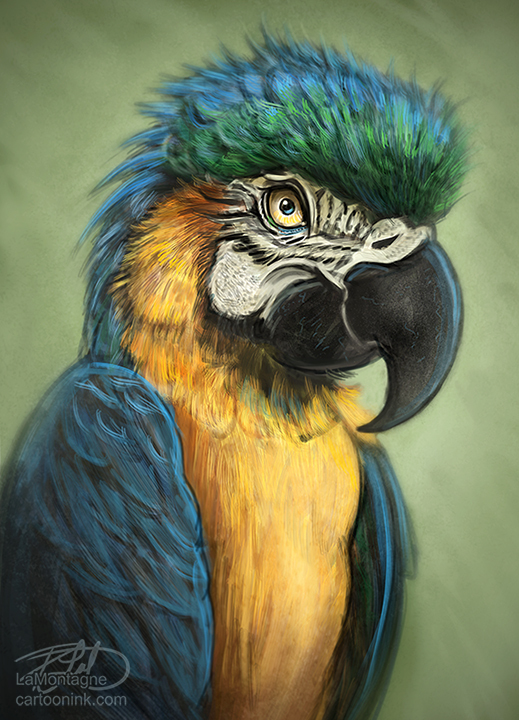 With hot coffee and tunes in the headphones, I decided to do a sketch painting of this parrot. With no intention of it becoming a finished painting, it was nice to just work on it without any expectations and you can never get enough practice. I plan to do a lot more of these this year as I quite enjoyed it.